Did Nintendo Just Create Better Words For 'Multiplayer'? If you thought the word "multiplayer" was a good way of describing the thing you do when you play a video game with friends, please consider the word "together." That's the option you'll get in the new 3DS game Kid Icarus: Uprising if you choose not to play the game's Solo mode. "Together" is pretty good. It feels warm. It's welcoming. These are not the kind of adjectives I usually associate with multiplayer games, especially online multiplayer game, which Kid Icarus offers. 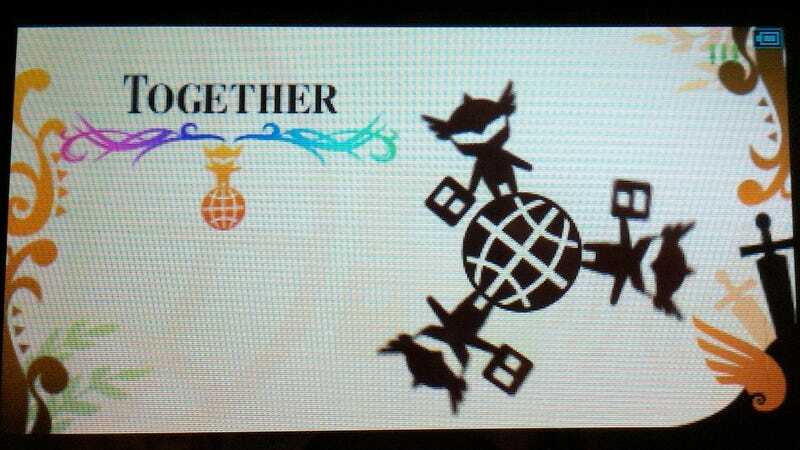 "Together" isn't an instant winner, though, because it's less descriptive than "multiplayer". You might read the word and think: "Together" doing what? But what "Together" lacks, "Nearby" and "Far Away" perfect. These two terms are what you see after you choose to start a multiplayer—I mean, "together"—session. They take the place of "Wireless" and "Wi-Fi," which are customary terms for either playing a 3DS game against people in the same room who also have a 3DS and playing a 3DS game over the Internet against people who have a 3DS. The old terms are jargon-y and, perhaps, technically redundant. The "Nearby" and "Far Away" terms also displace the horrible nomenclature of "Ad-Hoc" and "Infrastructure" that Nintendo rival Sony has championed. I've never seen these terms before. I now prefer them. I think Nintendo is on to something. A half-decade ago, Nintendo recognized that many people were too intimidated to play video games. They looked at game controllers and the people they considered to be gamers and were scared off. It wasn't for them. Nintendo made and marketed the friendly Wii to change that. Within gaming, I think there is a similar divide between those who enjoy multiplayer gaming and those who look at multiplayer, particularly online multiplayer the same way those pre-Wii people did. Online multiplayer is daunting and off-putting. Some Nintendo-style re-branding of multiplayer gaming could be a wonderful thing. That could be what these words do, though, I should note that this may well be a one-off. Nintendo sometimes takes lumps for over-simplifying technical things for its customers. This is a company that would rather tell you how many "blocks" of memory you have left in your 3DS or Wii than how many MegaBytes, the implication being that such a technical term would either scare you off or tell you too much. I won't condemn them here. If this is the start of something, Nintendo might, just slightly, help turn multiplayer gaming into a part of gaming that feels a little less off-putting to so many players. It could, corny and possibly intentionally as it sounds, bring more gamers "together." I've asked Nintendo if they can share more insight about their fine new words. If they have more to share, I'll let you know.